Viewing topic "MOXF8 vs MX88 which do i keep?" I have an MX88 that i’ve been playing around with for a few weeks and my 30 day period is nearly up for return/exchange. 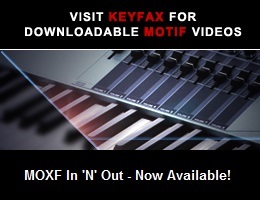 The other keyboard I was serious about is the MOXF8. I get the basic feature differences but if anyone could chime in as to why i should stick with the MX or go for the MOXF8 i’d greatly appreciate it. I used to have the MO8 and sold it for the MX. especially if you can comment on quality of sound...particular about the Acoustic Piano. From what i understand the same Tone generator is used in both but i can’t help shake the feeling the sound of the MX lacks a bit. The strength i see with the MX is how easy it integrates with cubase/computer. Can anyone comment on the MOXF8 in this regard? will i retain the same ease of connections? I may be wrong but but I think the MX88 is based on Motif XS and MOXF is based on the motif XF. I have not played the XS but the piano in MOXF is great and you can add a Flash-Board and load some new pianosounds to it. Thats is what I did. I added a 1GB board and have a lot of free pianos (S700, Motif original piano, The piano from Yamaha CP1 and a lot of more great sounds). The moxf also has a GREAT pattern sequencer that I use live with my band to be able to loop choruses etc. And a great sequencer. Moxf has 714 mb samplememory and you can add up to 2gb extra. MX has 166 mb samplememory and you can not add some extra. I think the keybed are the same. The MOXF8 has A/D inputs for mics and other external sound sources, the MX88 does not. That means you cannot record vocals and other instruments directly to Cubase or other DAWs with an MX88. It does have a stereo aux in though, presumably for playing along to backing tracks, but MX88 has no ability to act as an audio interface for any external sound source. Thanks for the input. I’m pretty much decided on the MOXF8. Auditioned a lot of the voices last night and really love what I was hearing. I have the latest driver installed for my Mac but noted something a bit quirky when trying to use the keyboard as a controller for Halion 6. I can assign the knobs on the keyboard for things such as volume in a slot or a parameter but its buggy as heck. erratic movements ..not smooth at all. I hope this is something i can sort out as that’s a really big thing for me and what I really liked about the MX. Some have documented knob-stepping issues, which may or may not be tolerable to you. One of several threads Here. That particular thread is so classic that NASA are considering including it on a possible update of the Pioneer Plaques. Unfortunately a musical recording was disqualified from being used on an updated Voyager Golden Record, due to detection of some stepping thought to be attributable to a MOXF. Hopefully Chewie5150 will obtain something useful from that thread. For others, reading it several times in the evening at bedtime may permanently eliminate insomnia. Ironically, another forum just experienced a long thread debate where the OP was certain the MX sounded much better than MOXF for APs. Theories abounded about different velocity curves, etc. I didn’t buy it then, i don’t buy it now MX vs MOXF. I have an XF and a MOXF. The difference in sound is at a dog-whistle level of nothing for my old rock n roll ears. i’m 1000% certain that nobody that hears me play can detect any difference at all. My 2c is don’t pick either board based on a difference in sound quality of the same device. That is not what is different between them. Pick the board based on what you want to do. MOXF has more capability for expandability, inputs, pedal controls. sequencing etc. That has zero value for some, great value for others. But the sounds - MX sounds are a subset of MOXF, which itself was derived from XF. They aren’t significantly different. MX has no flash expansion slot to store your own additional waveforms (samples0. If you don’t need or want this, or won’t want to pay for a flash board, then this has no value for you. What it does do is allow you to store 3rd party libraries that have new samples not already in your board. There are other subtle differences as well - but the core guts is the same architecture design. I wouldn’t downgrade from MOXF to MX but thats me, for me the price difference doen’t warrant it and to me MX is just a MOXF with a little less. I do a lot of custom sound design and I use that flash option. I needed to be able to port my library from my XF to MOXF, I was able to do that. I use the Analog in to run clips for song intros. I use the pedal input functions in MOXF, MX has less I think. See ... it’s about you and what you do. If you just want to play AP - well, first thing I’d suggest is neither of these are the right board. There are boards that specialize in AP and do it better. These are great all-purposes boards if you need some AP + EP + synth, strings, wind, brass, etc etc… But they are not the best at JUST AP. If you don’t value the added functions of MOXF, then you have different use than me and thats fine. Keep the MX. If you think you might want these added features later - get the MOXF. I’m new to the party here and realize I have a lot to catch up on. “detentgate” I see hahah. ahhh okay well that makes a lot of sense now that I’ve been catching up on some of these old threads. To be honest, if I knew that was an issue I would have likely kept the MX but now I have the MOXF and loving the sounds so will have to live with that I guess. Its really unfortunate. The MX knobs did not have detents and had smoother potentiometer action. Fair point about comparing the AP’s and I think if you were to do a blind A/B test it would be negligible. perhaps what I’m hearing is due to the limited inserts available for the MX. quick update here with my experience. Biggest save in combing through all those old threads was regarding the knob curve settings. Changing it to table 1 resolved the problem enough to where I was happy with the other keyboard. That was really the only thing that bothered me. In case someone else still has questions about the sound differences between a MOXF8 vs MX88, these videos can be of help. I know there has been a loooooong discussion about a MOFX and a MOTIF XF, which is not the point of my comment, but between a MOXF and a MX there are differences. Since a MX model has a smaller ROM it’s expected that the sound might be different. I own a MOXF and I played a MX Keyboard, my perception was that Pianos and Electric pianos sounded the same but some acoustic guitars sounded duller when playing the MX model. I just watched two videos and I perceived the same. Even though there are differences, I’d like to purchase a MX88 since my MOXF is a 61 keys keyboard and I like all its features. What had the Velocity Curve in Utility mode been set to? It makes a difference. See page 141 of the MOXF Reference Manual (http://download.yamaha.com/file/60478).